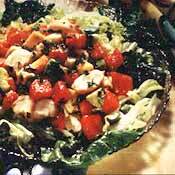 RECIPE TITLE "Jamaican Rock Lobster Salad Recipe"
Cut tails in half lengthwise, remove vein, cut into 1/2-inch slices. Combine lobster with watermelon, avocados, papaya, and cilantro. Pour lemon juice into small bowl and slowly whisk in oil. When oil is incorporated add honey and jerk seasoning. Pour over lobster mixture and refrigerate one hour, stirring occasionally. Place salad on a bed of shredded lettuce, sprinkle with coconut. Recipe reprinted by permission of National Watermelon Promotional Board. All rights reserved.